Get a flu shot. Make sure you get a flu shot early, because it takes two weeks for the vaccine to be fully effective. If you miss getting your shot early, though, get it as soon as you can, because the flu season can last into the spring. The CDC recommends that virtually everyone over the age of 6 months should have a flu shot. The only people who should not be vaccinated are infants under 6 months old and people who have a severe allergy to the vaccine itself or to an ingredient in the shot, such as eggs. Wash your hands. A lot. The best defense against the germs that cause colds and flu is washing your hands vigorously with hot water and antibacterial soap. The CDC suggests that you wash your hands before, during and after food preparation; before you eat; after using the bathroom; after attending to a sick person; after treating an injury; and any other time you think you should. Wet your hands, lather with antibacterial soap, and scrub vigorously all over your hands for at least 20 seconds – the time it takes to sing “Happy Birthday” twice. Then rinse with hot water and air dry or use a clean towel. If you can’t wash your hands with soap and water, use an antibacterial gel that contains alcohol. Keep antibacterial gel in your desk, your car and your purse or briefcase. Use disinfectant wipes on surfaces that other people touch, such as doorknobs and light switches. Disinfect your phone and computer keyboard. Keep wipes in your desk at work, in your home and in your car. Avoid getting close to people who seem sick. 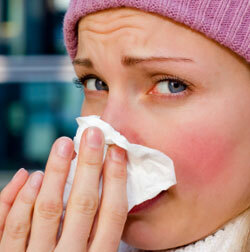 Stay away from co-workers who are sneezing and coughing. If you are caring for a family member who is sick, make sure you wash your hands often and use disinfectant wipes on surfaces they touch. Eat well, drink lots of water and get plenty of rest. You want your immune system to be at its best so it can fight off infection. Stay home. If you are sick, don’t go to work. Don’t go to the grocery store. Don’t go to the gym. Just go to bed. Cover your mouth and nose when you sneeze or cough. Sneeze or cough into your elbow rather than your hands. If you sneeze into your hands, you can spread germs from your hands to anything – or anyone – you touch. Don’t touch your eyes, nose or mouth. Germs can enter your body more easily through these openings. Treat mild symptoms with rest, plenty of fluids and ibuprofen or a similar over-the-counter medication for fever and body aches. If your symptoms become more severe, call your doctor.